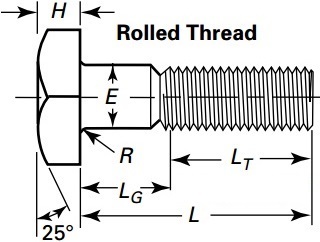 Drawing of square head bolt, cut thread, acc. to ASME B18.2.1. Top view of the square head bolt. *Unit: inch; E: full-size body diameter; F: width across flats; G: width across corners. 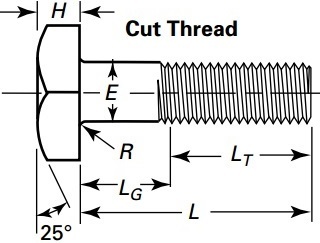 *Unit: inch; H: head height; R: radius of fillet; LT: nominal thread length for bolt lengths. Weight calculation formula for titanium square bolt: Wt = ( F * F * H + π * E * E / 4 * L ) * ρ * 1.64 * 10-5; ρ = 4510 kg/m3.